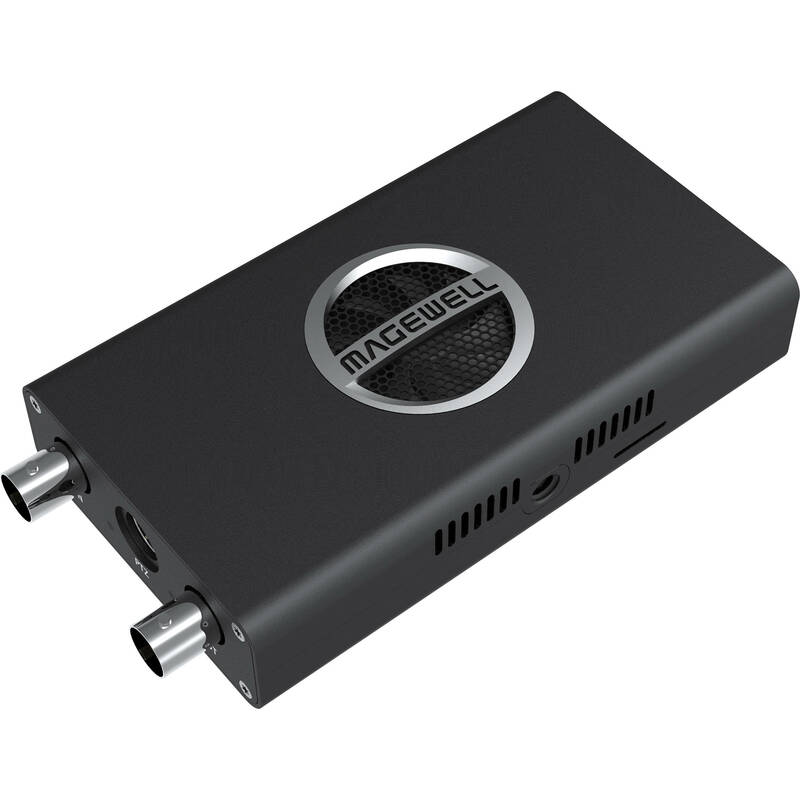 Convert SDI video to an NDI stream with the Pro Convert SDI 4K Plus video signal converter from Magewell. Pro Convert SDI 4K features one SDI input and one SDI loop-through output with eight channels of embedded audio, and it supports SDI input up to DCI 4K 4096 x 2160 video at 30 fps. The RJ45 Gigabit Ethernet port supports encoded NDI output up to DCI 4K 4096 x 2160 8-bit 4:2:2 video at 60 fps. The SDI loop-through allows you to view your input on a monitor while your NDI-encoded stream can be sent to a variety of NDI-compatible encoding or streaming applications such as OBS, XSplit, vMix, Wirecast, and others via Ethernet. The mini DIN-8 tally/PTZ port provides tally input to pass-through, as well as for use with the unit's status LEDs. The LEDs also indicate power, output, and input signal status. The unit is powered by a 5V power adapter connected to its USB 2.0 Type-B port or via PoE over its RJ45 port. The Pro Convert can be managed with a web UI to configure settings and to perform firmware updates via the USB port. A 1/4"-20 mounting thread allows you to mount the unit in a rack, with a bracket, or on a stand. Included with the Pro Convert are a USB cable, a 5V power adapter, a mini DIN-8 cable, and an L-bracket for mounting. Box Dimensions (LxWxH) 8.6 x 7.6 x 1.6"